on chanting: 292. Happy belated Purim! I had no idea this strange and wonderful holiday would take up so much time and energy... which is a very good thing, but I'm exhausted. This picture of my costume will have to suffice in lieu of (the substantially less than) 1,000 words to come. 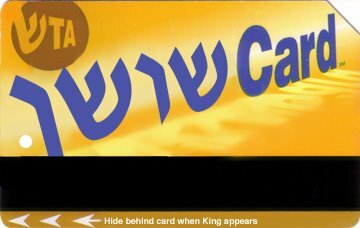 For those who do not usually ride New York City Transit or read Hebrew: it's a MetroCard, the thing we use to get from place to place, except it says "ShushanCard," the name of the city of the Purim story. Yes, it's very silly. I topped it off with a bright yellow wig and tights, which nicely complemented the color of the chicken suit worn by the rabbi who stood next to me and made sure I made no mistakes while reading the Megillah.